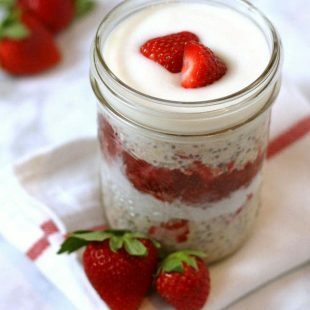 These Strawberries and Cream Overnight Oats are the perfect breakfast to treat yourself (or a loved one). Creamy coconut cream replaces the dairy and strawberry chia jam adds the perfect sweetness. I remember the first time I ever had real strawberries and cream with my mom at afternoon tea at the Plaza Hotel in NYC. I felt so fancy there dipping my strawberries in the cream and it sure was tasty. After going vegan I’ve been making strawberries and whipped coconut cream (which is just as good as I remember from my Plaza days) but I felt kind of naughty having just that for breakfast. So I thought I’d make something fun yet healthy based on my plaza experience – my Strawberries and Cream Overnight Oats. When I first was thinking about how to make these oats, I couldn’t decide whether to use my whipped cream as the creamy layer or not. I thought people might not want to whip up some coconut cream early in the morning. While I recommend making it if possible (because it is so tasty), I found that vanilla vegan yogurt is a nice substitute. Although not mandatory, I also really recommend adding my strawberry chia jam to the oats because it really brings it to another strawberry-ness level. You can always make the jam ahead of time because it lasts for a while in the fridge. In the recipe below I explain how to layer the ingredients to make a parfait but if you’re running short on time, you can add the strawberries and the yogurt with the oats the night before and it will be ready to eat without any hassle in the morning in the morning! FYI, in the pictures, the middle layer is coconut cream and the top layer is vanilla yogurt – yum! 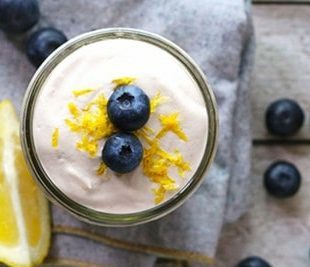 If you’re looking for another tasty breakfast, be sure to check out my Blueberry Lemon Cheesecake Overnight Oats! 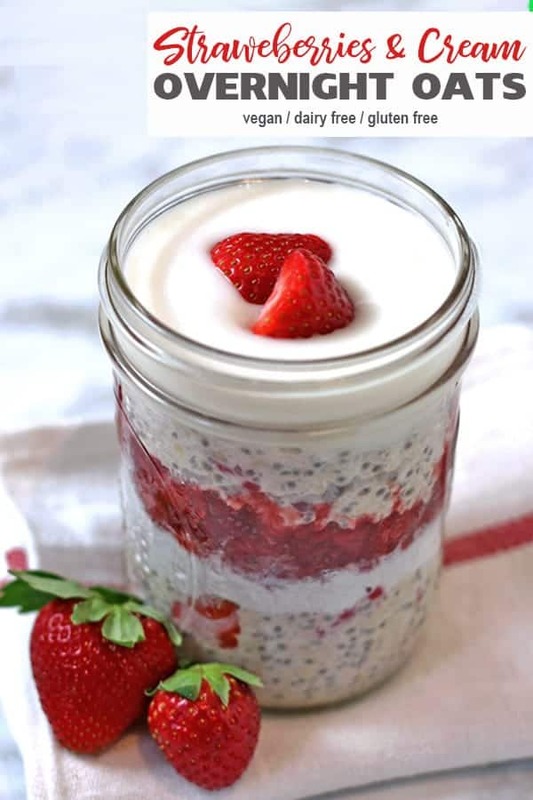 If you make this strawberries and cream overnight oats recipe, let me know what you think by ★ star rating it and leaving a comment below. 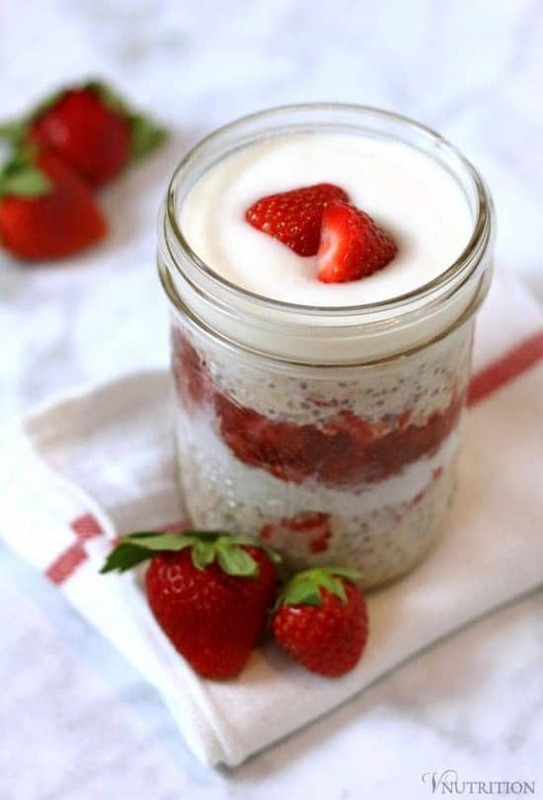 These Strawberries and Cream Overnight Oats are the perfect breakfast to treat yourself (or a loved one). Creamy coconut cream replaces the diary and strawberry chia jam adds the perfect sweetness. Add oats, milk, chia seeds, maple syrup and vanilla extract to jar/bowl with lid and place in fridge overnight (or for at least 4 hours). 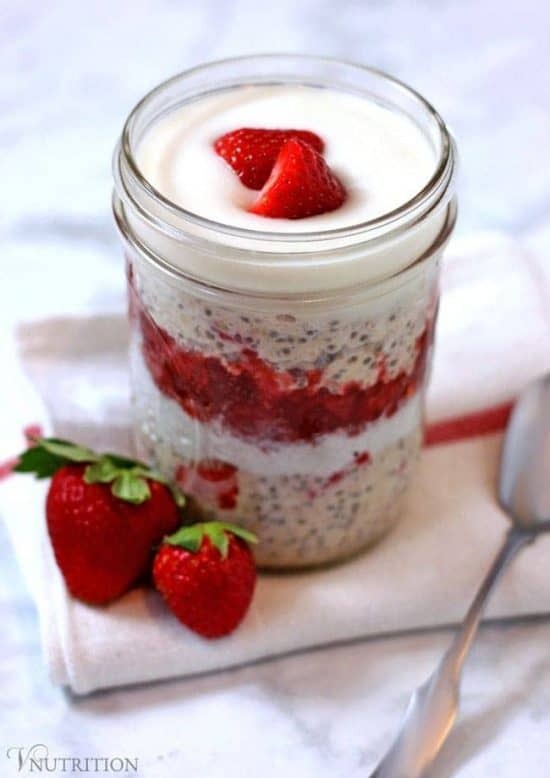 Mix strawberries into overnight oats (leaving a few to top off the parfait if you'd like). To make a parfait like seen in the pictures, layer 1/2 the overnight oats, then some yogurt or coconut cream, then chia jam (or any vegan jam of choice), then the rest of the oats, then more yogurt or coconut cream and top with more strawberries. That looks so delicious!! I love all of the layers. Definitely the perfect Valentine’s Day breakfast. Thanks so much Cadry! I was going to save it for Valentine’s Day as a surprise for my husband but he’s my recipe tester so he got his surprise breakfast early! 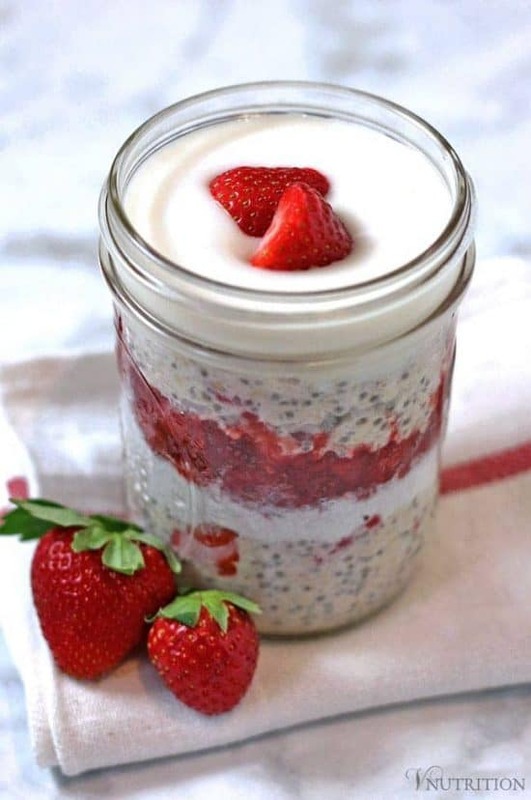 oh yum, one thing i look forward to in the summer are British strawberries, this strawberry overnight oats would be wonderful to make and take into work for breakast. I do love how you have captured the colour too, its amazing. Thank you so much Shaheen! I tried to get the lighting right in the pictures to get the nice color! I haven’t made overnight oats in a long while! Oh yum! These look so beautiful! I love vanilla yogurt (or vegan sub) with my oats too. So tasty! Yes, the yogurt tastes so good in there! Thanks Julie! Haha “schmoly”! I love it! It’s actually really good- and you know I don’t like to blow my own horn much…though I do tell Matt he’s lucky to have me and the pups everyday lol! I made these last night to have for breakfast this morning. I realized as I went to make them that I was out of oats though (d’oh! ), but tried with buckwheat. Worked out well actually – yum! Thanks so much Kimmy! Good to know we can switch out oats for buckwheat. Did you use kasha or uncooked buckwheat? I may have to try this! I love overnight oats – breakfast made easy! And this looks so yummy!! Strawberries are always a big hit around here. The whole family would love this! 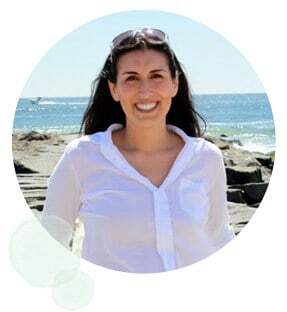 Thanks Jen – OOs are the best! Does anyone else think of them as OOs or is it just me? This looks like a perfect treat for Valentine’s Day morning! That’s what I was thinking Dianne! Thanks! This looks so delicious! I can’t wait to try your recipe. I love everything about it! 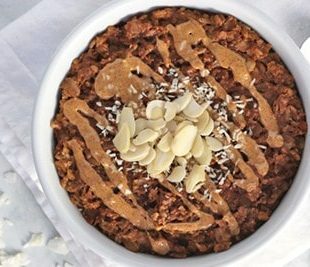 I definitely need to try this – I have a bunch of oats that I don’t know what to do with! Thank you so much Tazim! I had lots of oats too so I used them for OOs and I also made oat flour in the blender/food processor for muffins – they were good! My overnight oats never look that good… Yours are almost too pretty to eat! You’ll have to tell me what your secret is. ? Mine don’t always look this good either – especially on days I’m in a rush. I tried really hard for the photos lol! This looks wonderful and fun, love the addition of chia seeds and must try. Thanks! ooh, I need to check out your oats too! I bet they’re yummy! WOW this is perfect for Valentine’s Day. It’s so beautiful and pink and creamy looking. Thank you so much Emily! You’re so sweet! This looks wonderful! I haven’t had overnight oats in a while. Yay! I think I pretty much have almost all the ingredients to make this and it looks absolutely amazing! <3! Thanks Farrah! Let me know if you try them! Thank you Annmarie! I’ve been trying with the pictures! I am big overnight oats fan. I eat them a lot. They make such an effortless breakfast. I have never made strawberries and cream flavour though. They sound and look delicious and I don’t mind taking the time to whip coconut cream at all. It is so worth the effort! Wow, this looks so good! 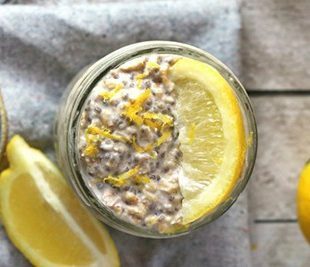 I love overnight oats, and this is so pretty too! Hi Mary Ellen! I use to go for strawberries and cream at the Plaza with my mom too! That is one of my favorite memories of growing up in NYC! 🙂 I think that coconut cream is a great substitute and must be absolutely delicious! Thanks for the yummy inspiration! That’s so fun! The plaza always brings back lots of good memories for me. Thanks so much! This is so beautiful! I love overnight oats at the best of times but this is super-special overnight oats. It’s overnight oats that went to the ball, won an Oscar, and looked stunning in every red carpet photo! In short, it’s fab, and I adore it! Thank you so much for allowing me to share it on my Perfect Vegan Valentine round-up. The post is now live if you want to check it out (an’ y’know, share it around a bit)! Oh, yum! How beautiful does this look? That coconut cream is to die for.